This recipe makes a stunning centrepiece for any occasion. 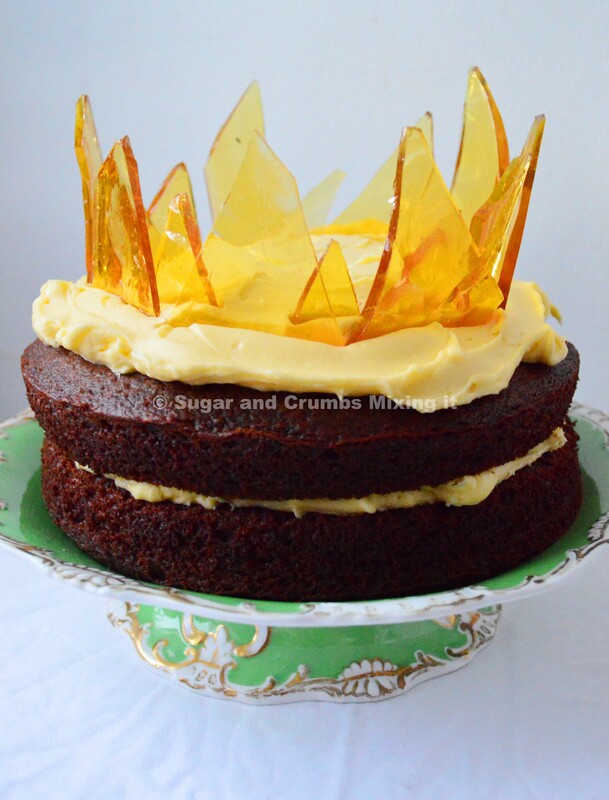 The chocolate cake is light, moist and made with black treacle, so it’s dark rather than sweet - the perfect foil for buttercream made with Sugar and Crumbs Salted Caramel Icing Sugar. And the sugar glass crown, while it looks really striking, is actually surprisingly easy to put together. Why not serve it as an alternative to the traditional Christmas cake? Preheat the oven to 200°C (180°C fan). Mix together the plain flour, baking powder, bicarbonate of soda, caster sugar and cocoa powder. Then, add the eggs, treacle, vegetable oil and milk. The cake mixture will be wetter than you might usually expect, so don’t worry about this. Grease two sandwich tins and line the bottoms with greaseproof paper. Divide the cake mixture between the two, then place in the oven and bake for 20 minutes, or until a tester inserted into the middle comes out clean. Allow to cool in the tins for a while before transferring to a wire rack. Next, make the sugar glass for the crown. First, prepare a tin to set the glass in – I used a square brownie tin. Line with tinfoil and then grease with a very small amount of vegetable oil – spread it thinly with a pastry brush. To make the sugar glass, mix together the caster sugar and the water in a small pan, and then warm over a medium heat. Do not stir – this is very important. Instead, simply swirl the pan every now and then. Bring to the boil and then watch carefully – it will suddenly darken to a deep gold and you need to take it off the heat when this happens. Pour into the prepared tin and leave to set, at room temperature, for about 20 minutes. While the glass sets, make the buttercream – mix together the butter and Sugar and Crumbs Salted Caramel Icing Sugar until smooth. When the sugar glass is set, it should be very hard and completely cold. Whilst it’s still in the tin, tap it sharply with the handle of a knife in two or three places, to shatter it into pieces. Spread half the buttercream on top of one of the cakes, and sandwich with the other. Top with the remaining buttercream, and then arrange the sugar shards on top – use the largest first, to make a circle, and then add the smaller pieces to fill in the gaps. This cake doesn’t need to be kept in the fridge, but it will be at its best in the first day or two.